The bloggers tried their best to make us all think Solo was a disaster. But Solo is exactly the fun adventure backstory Star Wars fans have been waiting for. 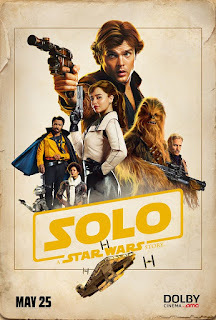 Irreverent, rollicking, sassy, and filled with enough easter eggs to make the fans happy, Solo is the kind of popcorn cinema that is perfect for summer at movies. I was a bit guarded after all I had read. And in the first act there are a few jarring moments, a few convenient plot jumps which feel a bit false, but soon this fades away as the story, the characters, and the world of Star Wars takes over and we can relax and have a good time. Alden Ehrenreich nails it as Han, capturing the spirit of Harrison Ford all the while making it seem effortless. Same with Joonas Suotamo who has already taken over the role of Chewie in Episodes VII and VIII, one doesn't even notice a new actor is playing the part. Another stand out is new character L3 played by Phoebe Waller-Bridge, a droid who starts a rebellion. But the real star is Donald Glover as Lando. He is as charismatic as Billy Dee Williams and takes up the entire screen whenever he's on camera. Let's all hope there is a Lando movie one day. And did I mention easter eggs. Oh there are some doozies. I don't want to spoil it but Solo has a few surprises to watch for, a big part of the fun for fans and they don't get in the way for more casual viewers. Ron Howard, a director whose work I rarely ever enjoy, has crafted a different feeling for Solo, filming it more atmospherically, more stylistically, than a typical Star Wars film. The film has rougher edges and is shot in a more roughshod manner. Perhaps this has something to do with the production but it fits the story and character. The verdict is that I hope Solo isn't a one shot, that perhaps this story isn't over yet and we'll get a bit more of what Han and Chewie do before they are hired to take Skywalker to Alderaan.